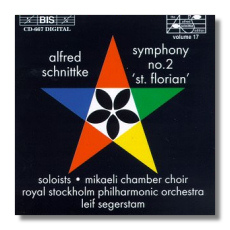 Schnittke completed this symphony in 1980, but it is the last of his first five symphonies to reach CD (he recently completed his Eighth, however). Complexity can't be the delaying factor; his Fourth Symphony also requires soloists and a choir. The Second is not as forbidding as some of the composer's other symphonies, and it strikes me one of his best, so approachability and quality don't seem to be factors, either. The work's subtitle refers to the composer's visit in 1977 to the burial place of Anton Bruckner. Schnittke was moved by the setting sun, the mysterious feel of the Baroque Church of St. Florian, and the choir singing an evening mass somewhere out of his sight. When Gennady Rozhdestvensky requested a new work from Schnittke for the BBC Symphony Orchestra, he reminded the composer about his St. Florian experience, and the Second Symphony took off from there. The movements begin with the choir or soloists singing sections of a Gregorian mass, but the orchestra soon takes over from them. The orchestra is a large and diverse one, with important parts for organ, bells, and electric guitar. Some of the music is almost deafeningly noisy, but not gratuitiously so, and there are many pages of spare, intimate writing to provide contrast. The instrumental music alludes to the Gregorian chants, and also to the chants' texts in an almost programmatic manner. The fourth movement, "Crucifixus," for example, is marked Pesante, and it is a heavy, painfully dragging, musical juggernaut that easily can be heard as a journey to some dire Golgotha. Like Sofia Gubaidulina, Schnittke also uses the "principle of the cross" to govern the symphony's harmony and form. He constructs chords and intersects vertical and horizontal musical elements to produce actual images of a cross on each page. Leif Segerstam is the right conductor for this wildly eclectic and yet completely sincere work, and he gets good work out of the orchestra, choir, and soloists, who all have a difficult task. Try the Pendereckian beginning to "Ex resurrexit" for some intriguing choral work! As is usual for this company, BIS's sound is wonderful. This is the seventeenth volume in their ongoing Schnittke series. Their dedication to contemporary composers like Schnittke, Gubaidulina, Denisov, Sumera, Sallinen, and others is a heartening thing in a world where most other record companies would rather play it safe.